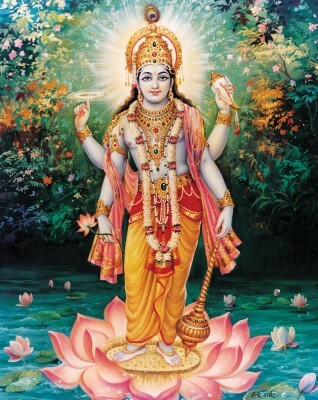 AzhwAr says that despite emperumAn bestowing unblemished knowledge on him, he was finding it difficult to know him, while Siva, by carrying out some penance holding on to his breath, is trying through his own efforts to know emperumAn. How ignorant is this action! Why is AzhwAr struggling to know emperumAn fully? What is the hurdle? Even though hurdles which contract knowledge have been removed and there is no shortage of implements for gaining knowledge, it is impossible to measure those entities which cannot be measured. Thus, it is not possible to measure (know) emperumAn with the knowledge granted by him. vEdhas, which set out to measure him, returned, saying that he is “mahAntham” (he is great)[thaiththirIya upanishath]. One can keep seeing the same features again and again, but not the full picture. Even if a person stands near the sea (at the shore), isn’t it true that he cannot see the whole ocean! aRivAn Am – would he know? Ay ninRa – unlike other upAyams (paths) emperumAn is readily available [while the others are to be attempted by jIvAthmA]. aindhu poRi vAsal – the five sensory organs viz. ears, mouth, eyes, nose and skin. Any one among these five is enough to prevent a person from carrying out attempts on his own as means [to attain emperumAn]. Since these are capable of pulling a person towards them through some deceit or the other, AzhwAr refers to these senses as “poRi” (trap). The word “pOrkkadhavam” refers to the fact that these sensory organs are waging a battle against the jIvAthmA (pOr means war and kadhavam means door). While the jIvathmA tries to control his senses, these senses slip out of his hands making it difficult for him to control them and they wander all over the place. sAththi – even if one were to close the door [to the senses] shut, it is almost impossible. If one tries to control one sense, the others will break free and pull him. When one attempts to plug water, which is flowing rapidly, it will create a hole elsewhere and run forcefully again. Senses are similar to this phenomenon. Hasn’t arjuna said in SrI bhagavath gIthA 6-34 “chanchalam hi mana:” (mind is restless)! If one does not feed the senses, they will tear up the person. As SrI bhagavath gIthA says in 2-59 “param dhrushtvA nivarthathE” (only after seeing the superior entity (emperumAn) will desires exit). Thus, is there any way to control the senses other than seeing emperumAn? The opinion here is that while it is possible to control the senses to an extent by carrying out certain deeds, it is virtually impossible to control them such that they do not go after vishayam (pleasures). Alamara nIzhal – under the shade of the banyan tree where he [siva] was performing his penance. aram nAlvarkku anRu uraiththa – aRam here refers to the path to attain emperumAn. Siva preached four rishis agasthyar, dhakshar, pulasthyar and mArkaNdeyar about knowledge on emperumAn. anRu uraiththa – Siva preached others even before he had heard fully about emperumAn. Just as a person, by name bAlAgi, who did not know about brahmam (supreme entity) preached the most learned ajAtha Sathru about brahmam, Siva also preached. This is similar to a person trying to enjoy the goal even before carrying out the deeds to reach it. Siva had consumed poison due to his thAmasa guNa (the quality of being ignorant). SrI bhagavath gIthA 14-27 says “sathvAth sanjAyathE gyAnam” (one gets knowledge through sathva guNa (purely good quality)). But, here, Siva desired to gain knowledge through his thAmasa guNa. Alam amar kaNdaththu aran – when emperumAn churned the milky ocean, “hAlahAla visha” (a poisonous substance) came out first. emperumAn ordered Siva to consume it and Siva did the same, keeping it in his throat. His pride comes out of this act of taking the poison. Just because he had preached a few persons who had slightly inferior knowledge to his own, and because he was able to hold poison in his throat (with the mercy of emperumAn) could he measure (know) emperumAn? While bAlAgi had not known brahmam, he pointed out whatever he saw to ajAtha Sathru and said “this is brahmam, hold on to this”. In the same way, while Siva had not fully realised brahmam, he preached others about brahmam. Is it possible to preach others merely because one had the power to consume poison and the power to destroy others? sIrAmap piLLai (twin brother of parAsara bhattar, both being the sons of kUraththAzhwAn, prime disciple of SrI rAmAnuja) spoke ill of Siva because he was proud and called himself as Lord. parAsara bhattar told him “Siva, by nature, is a good person. Only because of his thamO guNa (quality of being ignorant) he is proud. Hence, do not vilify him”. We shall enjoy the 5th pAsuram next. This entry was posted in iyaRpA, mudhal thiruvandhAdhi on June 11, 2017 by T N Krishnan.